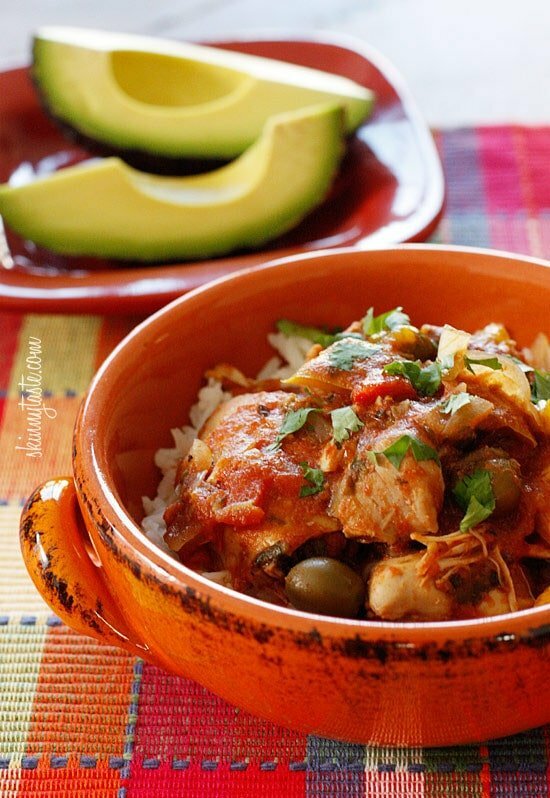 Chicken a la Criolla, a simple yet flavorful Latin dish made with stewed boneless skinless chicken thighs bell peppers, onions, garlic, tomatoes, olives, cilantro and spices. Slow cooker or Instant Pot directions provided. 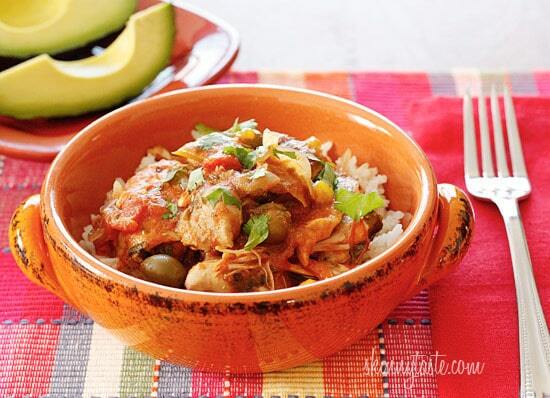 Criolla (literally creole) is a Spanish word widely used to describe Caribbean or Hispanic cuisine. This is one tasty and inexpensive meal for 10 Smart Points. 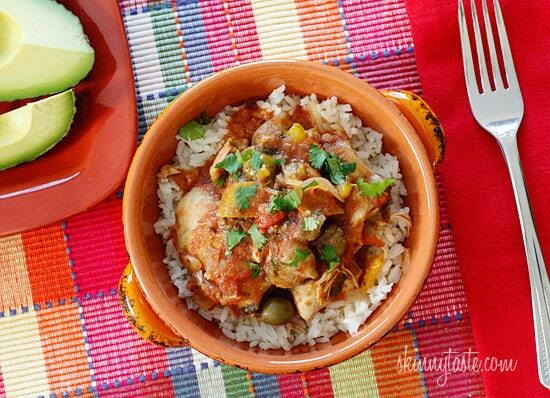 A few other chicken Crock Pot recipes I love are Pollo in Potacchio (Braised Chicken with Tomatoes and Rosemary), Moroccan Chicken and Olive Tagine, and Easy braised Chicken Drumsticks in Tomatillo Sauce. As promised, I played around with my crock pot last night making this easy yet flavorful dish which requires no pre-cooking on the stove. In most cases, I think it’s always best to brown the chicken, onions and garlic in a skillet before adding it to a slow cooker because it adds a depth of flavor you just don’t get when you skip that step. That being said, for this dish I didn’t think it was necessary because it has so many aromatics, herbs and spices that flavor is not lacking. Because slow cookers tend to mute the flavors from the long cooking times on low heat, you should always taste it at the end and adjust the spices and salt if needed. Also, adding extra fresh herbs at the end is always a must in my opinion. This dish was loved by all in my house, including my two year old. Enjoy!! 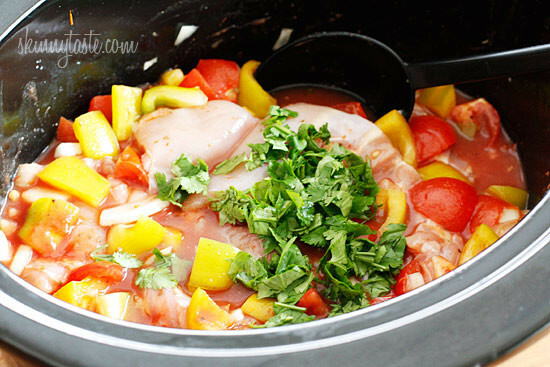 Place chicken, onion, garlic, pepper and tomatoes in the crock pot. Season with salt, cumin and oregano. Mix well so everything is seasoned. Add tomato sauce, alcaparrado (or olives) along with 1 tbsp of the brine, 1/2 cup water, bay leaf and cilantro. 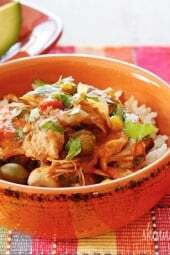 Mix well and set crock pot to HIGH 4 hours or LOW for 6 to 8 hours. When done, taste for salt and seasoning and adjust spices as needed. Add 2 tbsp chopped fresh cilantro and serve over rice. 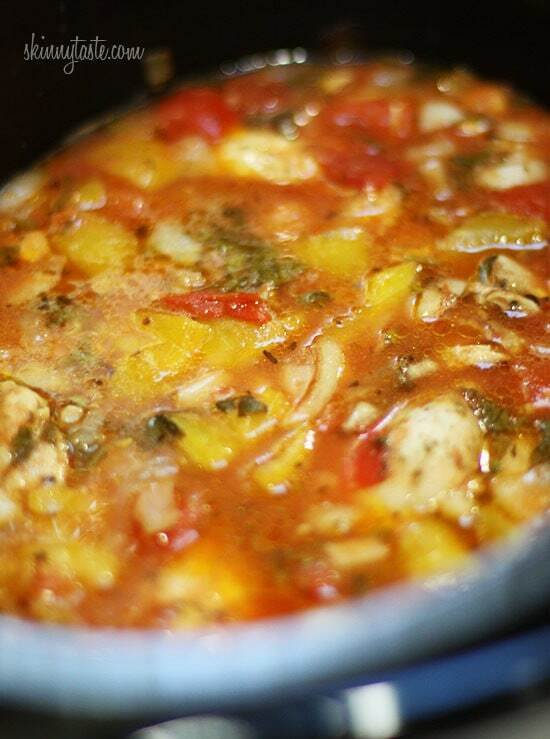 Place chicken, onion, garlic, pepper and tomatoes in the instant pot. Season with salt, cumin and oregano. Mix well so everything is seasoned. Mix well and cook high pressure 20 minutes, natural release. I did this tonight in the instant pot for 15 minutes NPR was very good! Im thinking it will be even better leftover letting the flavors sit! Was 15 minutes long enough in the IP? I got one for Christmas and am trying IP Chicken Parmesan tonight; I can’t wait! I don’t understand how every single one of your recipes turns out absolutely, freakin delicious. Anyway, thanks again for another wonderful recipe. You’re amazing!!! I made this tonight and will for sure be making this again. So good. I serve over the Mexican cauliflower rice. Thank you for all your wonderful recipes. Made this yesterday and served it with rice and avocado. Very yummy! Will definitely make this again. What is the brine? it says to add 1 T of the brine. Can you make this without the crockpot? Do I put it in the oven or stove top and for how long. I accidentally boughthe Italian Castelvetrano olives instead of Spanish. Ugh. I don’t know if three is a major difference and can’t seem to find anything online. Should I just use these or leave them out? Thanks! You don't say to chop the plum tomatoes. Are you supposed to put them in whole? I went ahead and chopped them anyway. Can you clarify please. I was wondering the same thing. I chopped mine last night but haven’t thrown everything into the crockpot yet. 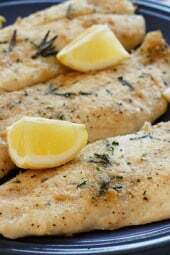 i plan on making this soon, and using chicken breasts..do i need to cut them in half ? Really good! I forgot the tomatoes so I used a 28 oz can of crushed tomatoes (and didn't add the water) and it came out great! The pepper and onion were still a bit crunchy after 4 hours on high (liked that). Thanks for a great recipe! What is the yellow ingredient in the pictures? I think she used a yellow pepper. Crockpot??? This is going into the Instant Pot! How long did you put it in for? My dish came out tasting amazing but very soupy. Is that right? Made this on a rainy Monday and my family loved it – all of it was eaten up! I followed the recipe exactly except I upped the spices to 1 tsp each of oregano (used Mexican oregano) and 1 tsp cumin. I bought a family pack of the boneless skinless thighs and there were 12 thighs or about 4 lbs. So I only used half the pack and 1 thigh per person was plenty (or thow 8 in for leftovers! Also, we thought it was similar to a stew we make over the stove with salmon! 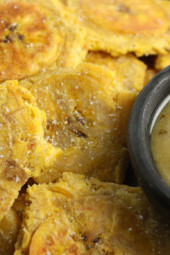 (Colombian dish we make.) Just a thought! Thanks for all your recipes – I too have been making many of these over the past few months and they are healthy and tasty and my family loves them! 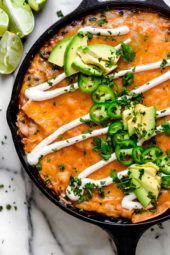 Making this now…I have been enjoying your recipes for 7 months and have lost 18 pounds, and have been able to maintain a couple pounds below my goal weight. Thank you! Finally tried this recipe. It was delicious!!! Thanks for all the great recipes. Any thoughts on a replacement for the olives if you're not a fan of olives? Also, do you think this would freeze well if I only eat half and save the other half? Can someone let me know what alcaparrada is and where I get some? Please and thanks. Amazing had it with brown rice and the next night on tortillas. Everyone loved it. When using a pressure cooker, how long and how much liquid please?? I am new to pressure cooking and would love to make this recipe. I would love to know as well!! As always another successful meal from your recipes, I cook all my meals and believe me, I always appreciate your great ideas. Thank you! My husband and kids loved this meal. I used cherry tomatoes and regular green olives stuffed with pimento, because that is what I had on hand. It turned out great. Thank you for a new crock pot meal. I am making this tonight. When I put it in WW counter, I found it had 7 points / serving… It counted 28 points for the chicken. Is that right? I am looking forward to this, it looks so good! I just made this but didn't add the cilantro because my husband cant stand it so i added pepper flakes instead and it was so yummy! a little spicy but the flavor was great. Thank you! I am so excited to find this site. Everything looks so delicious! I'm on the fence about joining WW…I tried it before…but I like the points system they use because I can control my calories and portions! I'd like to compliment you on the presentations and photography too…top notch! I'm impressed by all the positive reviews your creations receive. I'm making this as my very first recipe and it's been cooking a couple hours and already smells scrumptious! I'm looking forward to finding and trying more of your tempting meals. We loved this one! I cooked it on low for about 9 hours and it wasn't overdone at all. I subbed chicken breasts because that's what I had on hand. Fantastic! This is a fantastic recipe, but the points as stated are completely incorrect. 2 pounds of boneless, skinless chicken thighs = 52 points plus. Add 3/4 cup of rice per serving and it's up to 14 points plus per serving. I'm just going to divide it out into more servings and add less rice per serving. The USDA changed the calculations on chicken thighs after I posted this. While yes, cilantro is very subtle while it is cooked, I'd leave it out if you don't like it. I personally love cilantro but my mother hates it. A lot of people complain that cilantro tastes like soap, and the reason for that is because it's linked to genetics. There tons of reports that it's a gene variant related to taste and smell. Olives are awesome, though. They can add a lot of flavor, but you don't have to eat them.